Traditional rock-sourced calcium supplements only slow annual bone loss. But AlgaeCal plant-sourced calcium supplement is GUARANTEED to increase bone density in women of any age! AlgaeCal is a kiwi fruit-sized South American marine algae. This rare algae is simply hand harvested, sun dried, then milled into a powder. There is no extraction process or additives used – just pure whole food calcium and minerals coming from a living plant, making it the best vegetarian calcium supplement and natural osteoporosis treatment available. It is this nutrient powerhouse that gives us confidence to guarantee your bone strength improvement. AlgaeCal Inc has pioneered the multi-nutrient approach to bone health. AlgaeCal is more than a whole-food, plant calcium supplement. 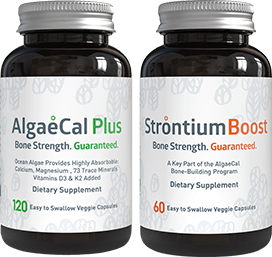 This algae also contains ALL 12 other essential bone supporting minerals; magnesium, boron, copper, manganese, silicon, nickel, selenium, strontium, phosphorus, potassium, vanadium, and zinc. On top of that, we have added vitamins D3 and K2-7 to create our flagship product, AlgaeCal Plus. This multi-nutrient approach has proven in clinical trials to be the best natural treatment for osteoporosis on the market. You get a full spectrum of minerals, vitamins and plant nutrients working for you instead of a single element like most calcium supplements provide. 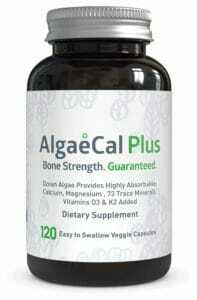 AlgaeCal (Lithothamnion Superpositum – or as the locals call it, algas calcareas), is an organic calcium supplement. This algae superfood “pre-digests” the calcium and minerals in seawater – making it the best-absorbed calcium supplement on the planet. Want proof? Read the peer-reviewed study on why Algaecal is the best absorbed calcium supplement. Is AlgaeCal Your Best Treatment For Osteoporosis? Guaranteed to work scan after scan for 7 years! Don’t waste any more time. Get the best calcium supplement for your bones! Science says that once you reach peak bone mass (age 40) you begin to lose about 1% of your total bone density every year thereafter. For your bones, that’s not great news. AlgaeCal has conducted three human clinical trials, which prove you can increase bone density at any age – even in your 80s! 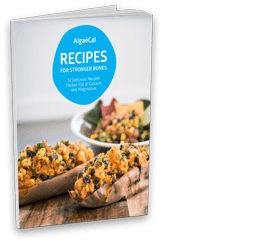 These comprehensive studies show AlgaeCal is effective in as little as 6 months…and continues to build new bone year after year for at least 7 years. They are found in prominent peer-reviewed journals: Nutrition Journal, International Journal of Medical Sciences, and the Journal of the American College of Nutrition. What are the Signs and Symptoms of Calcium Deficiency? From minor symptoms to severe, we cover the 17 signs of calcium deficiency you probably don’t know of. What are the Top Calcium-Rich Foods? Milk isn’t the only food source high in calcium. Discover the top animal-based and plant-based calcium-rich foods. What Foods Should I Avoid for Osteoporosis? Are you eating bone-damaging foods? You’ll be shocked to discover 8 foods that you may be eating, but shouldn’t. Can Exercise Alone Increase Bone Density? Just because it’s a common belief doesn’t mean it’s a fact. Does exercise alone really increase bone density? Discover the truth!